Sharon's grammar school and high school friend Laura's dad passed away. Joe Mellish passed away peacefully at home in the early morning hours on August 10, 2017 at the age of 84. Joe was born in Plymouth, PA on April 7, 1933. He graduated from Penn State University in 1955 with an Aeronautical Engineering Degree. He then served in the Air Force as a Navigation Officer from 1955-1958. Joe moved to Sacramento in 1958 and worked for 38 years at Aerojet. He met his wife Claire Nevins, while they both were working at Aerojet. They were married in 1960 and raised their 4 children in their current home. 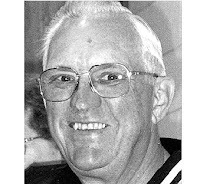 Joe was an avid Penn State Nittany Lion Fan and was often cheering on his team at Players in Fair Oaks with his fellow Penn State Alumni. Joe enjoyed watching sports, wine tasting, traveling the USA, and spending time with friends & family. Joe is survived by his wife of 57 years, Claire, children Laura, David (Kristi) and Steve (Valerie) and sister, Irene. He has 3 grandchildren, Daphne, Bryce and Brenna. He was preceded in death by his eldest son Mark. A visitation will be held on August 15th from 5-7pm with a Rosary at 7pm at Nicoletti, Culis & Herberger Funeral Home, 5401 Folsom Blvd. Sacramento, CA. Mass will be held on August 16th at 10:00 am at St. Mary's Church, 1333 58th St., Sacramento, CA. A private burial to follow. In lieu of flowers, please make a donation to St. Mary's Church Building Fund in Joe's memory.